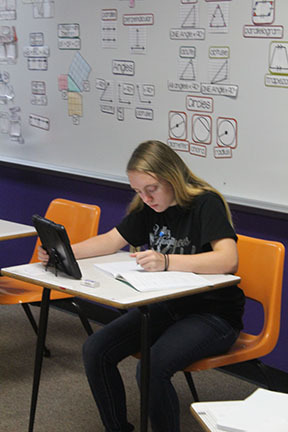 Each year Valley Heights students take state assessments. State assessments are Standardized test that help educators and policy makers evaluate how well students are learning, also to see if the school is making the requirements for federal and state accountability. In the high school, Freshman and Seniors don’t have to take Assessments but Sophomores and Juniors do. The sophomores take English and Math assessments while the Juniors take History and Science. This year, Student Council put an incentive in place for kids to work extra hard on their assessments. “I think that it is one of the best options out there to motivate everybody to do their very best on State Assessments,” said Samantha Vermetten, So. The reward for those taking assessments is based on how well they do as an individual. If the Individual is in a level 4 they will get a full day off of school. If an Individual is lower than a level 3 they will receive a ½ Day Off, and if the Individual has at least one assessment in level 2 they will have No Seminar for 1 week. For the Freshmen and Seniors who aren't taking the assessments, will also have the chance to get a day off of school. They will need to meet eligibility requirements and have zero missing assignments on the most recent weekly assignment check. The incentive day will take place on May 3rd, which is also Charles Steele Playday.